I'll never understand all the love for Eleanor. Not Mrs. Franklin Roosevelt, mind you. She was one awesome gal. I'm talking about the "Eleanor" 1967 Mustang GT 500 featured in the 2000 remake of Gone in 60 Seconds. Don't get me wrong, I enjoy that movie as much as the next guy, and I also like Mustangs, especially ones from the 60s. 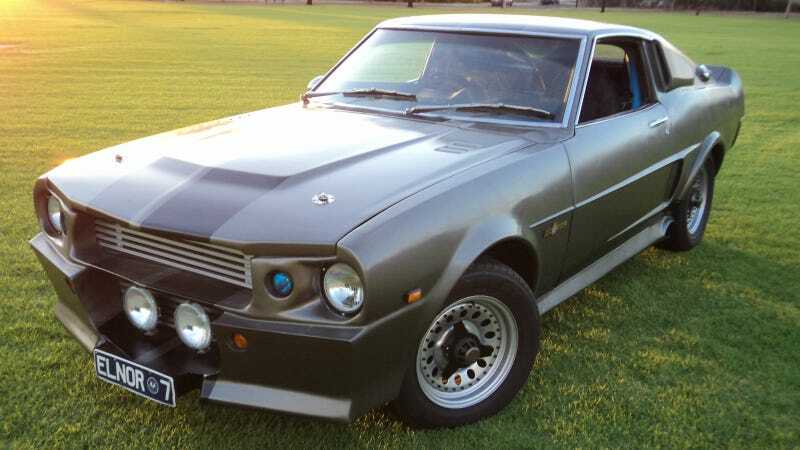 But the Eleanor kit always seemed garish, unnecessary and out of place on an old-school pony car. It has proven quite popular for some reason, as a bunch of Eleanor replica-makers have popped up since the movie came out. But here's one way to save money: put a strikingly similar version of that garish, unnecessary, out of place bodykit onto a 1970s Toyota Celica liftback. Sound crazy? Well, someone did it. And a few weeks ago, someone bought it on eBay from an Australian builder. This right-hand-drive 1977 RA28 Celica went for $10,395 at the end of February. Actually... I like this a lot. Hear me out! I'm not a fan of the Eleanor kit, but that's a damn decent recreation. And a Celica is an interesting and fun choice for it, since it was kind of a Japanese version of the Mustang for a good while. Plus, this buyer is getting a restored, classic Celica with a manual transmission and a mere 80,000 km on the odometer for just $10 grand. I'll go with nice price on this one even if I'm not nuts about how it looks. Thoughts?